Outdoor displays are one of the most widely-purchased categories of signage in the industry. Outdoor trade show display's versatility and durability allow brands to be advertised year-round, no matter the season, which has the potential to give users of outdoor displays a "leg-up" on the competition. 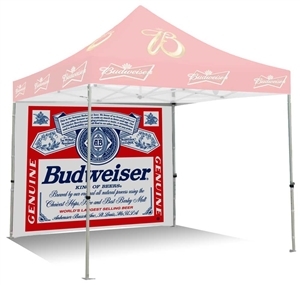 Additionally, the summer months bring about the outdoor festival and event season, where the possibility of reaching thousands of potential customers through an outdoor booth area demands that companies use every possible resource for displaying their brand in the most dynamic way possible. One of the Widest Selections Of Outdoor Displays in the Industry! Craft the look your brand deserves at its next event when you choose outdoor display booths from APG. Many outdoor booth display areas begin with the traditional Pop-Up Tent, but we also offer some upgrades to this event stalwart, such as the ability to include a feather flag on the top and sides, as well as Inflatable Tent options. These add-ons and upgrades let you make the most of your outdoor display stand, sharing a unique message and drawing targeted customers to your brand. For outdoor display signage, our Feather Flag selection is one of the best in the industry, with Premium shapes that represent the evolution of the standard Feather/Bow Flag. Additionally, our Outdoor Event Furniture selections - including brand-new Inflatable Event Furniture - can add the perfect "finishing touch" to your area, inviting event-goers to get comfortable with your brand. As any exhibiting veteran knows, an outdoor trade show display is more than just a structure. It must function and work as an inviting space for prospective customers, one that sparks conversations and makes visitors feel welcome. Our outdoor display booth upgrades and extras help achieve that warm and welcoming feel. We also offer outdoor display signage, like custom-sized concert banners, tailored to meet your exact specifications using a wide variety of printable substrates. Don't see the particular item you're looking for? No problem, just let us know about it and, chances are, we can get it for you. Our outdoor display selection is always evolving to incorporate the latest outdoor display innovations, developments and trends. This approach is part of our commitment to serving as your one-stop source of exhibiting products and services. Why Outdoor Displays from APG? At APG, our outdoor displays banners focus on your brand needs and messages. What are you trying to share with prospective customers? What will entice them to learn more about your brand, its products and its services? We can connect you with the perfect outdoor displays to meet those needs. These outdoor trade show booths leave plenty of space for text and large brand graphics that capture attention and draw visitors to your booth or presence. And we don't offer only preset design templates. We work with you to craft an outdoor display banner that is customized and unique. You hold the power to create the look and feel that will best serve your brand. These outdoor display booths and banners are also durable. When you're adhering to a busy exhibiting and events schedule, your event marketing materials will take a beating during transit and display. These events take place both indoors and outdoors, and outdoors events can wear out an outdoor display stand over time. At APG, we're committed to providing only the most durable outdoor display booth solutions. These outdoor trade show displays will work for you season after season, giving you durable performance that saves you money while looking great and capturing attention at event after event. It's all about return on investment in the event marketing world. Your brand spends a great deal of money in creating outdoor trade show displays and traveling to participating in expos and other events — it's important you enjoy a return on that investment. At APG, we're experts at helping brands across a number of industries create the look that will boost return. Our quality and durable outdoor trade show displays will also help you save money over the long-term and maximize the investment you make in events. APG's wide array of outdoor displays means that you can find the ideal solution for your upcoming event. Our new Premium Feather Flags, Pop-Up Tents, Inflatable Event Furniture and more are the perfect places to start. If you can't find what you're looking for, call us and speak to one of our dedicated customer service reps, who are always glad to help point you in the right direction. We are here to help you succeed every step of the way!